Decades after completing his traditional education as a classicist at Oxford and serving as tutor of William Cavendish, Thomas Hobbes became convinced that the methods employed by mathematicians and scientistsgeometry, in particularhold the greatest promise for advances in human knowledge. Voluntarily exiled to Holland during the years of Parliamentary Rule, the royalist Hobbes devoted much of his time to the development and expression of a comprehensive philosophical vision of the mechanistic operation of nature. 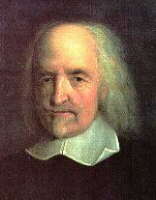 Although he returned to England with the restoration of Charles II, Hobbes was for the remainder of his life embroiled in bitter political and religious controversies. They did not prevent the ninety-year-old Hobbes from completing his English translation of the works of Homer. Hobbes's first systematic statement of a political philosophy, Elements of Law, Natural and Politic (1640), relies heavily upon the conception of natural law that had dominated the tradition from Aquinas to Grotius. But his views had begun to change by the time he reissued portions of his work in a Latin version known as De Cive (1642). The Leviathan (1651) is the most complete expression of Hobbes's philosophy. It begins with a clearly materialistic account of human nature and knowledge, a rigidly deterministic account of human volition, and a pessimistic vision of the consequently natural state of human beings in perpetual struggle against each other. It is to escape this grim fate, Hobbes argued, that we form the commonwealth, surrendering our individual powers to the authority of an absolute sovereign. For Hobbes, then, individual obedience to even an arbitrary government is necessary in order to forestall the greater evil of an endless state of war. Hobbes's ethics by Sharon Lloyd and Susanne Sreedhar. The Thomas Hobbes site by Eric Hochberger. A section on Hobbes from Alfred Weber's history of philosophy. Steven Darwall's lectures on Hobbes. A summary treatment by Robert Sarkissian. Rosalba Dur´n Forero's comparison of Hobbes with Spinoza on gender equality. A paper by Juhani Pietarinen on Hobbes and the Prisoner's Dilemma. Discussion of Hobbes's mathematical significance at Mathematical MacTutor.